The coming of NDA and BJP in complete majority in the current Lok Sabha election has created an euphoria in the entire nation. The media since last few days has been following Modi like a shadow and bringing its each movement on National Television. In today's 'Sunday Times' the an article by 'Swaminathan Aiyar' nicknamed 'swaminomics' particualr caught my attention. He claims the popularity of the BJP in Uttar Pradesh and Bihar is attributed to the migrant workers who carried with them stories of the successful Gujarat model which they witnessed. It is a remarkable logic considering the fact that migrant workers from UP and Bihar form a sizeable workforce in western India and has been a target of regional parties like MNS and Shiv Sena since years now. Now let us come over to the eastern part of India particular the states of West Bengal, Orissa, Seemandhra and Tamilnadu which elected regional parties in their constituencies.This somewhere displays that people residing in the eastern part of India do not share the sentiments of the nation and are un-aware of the happenings in other parts of India. 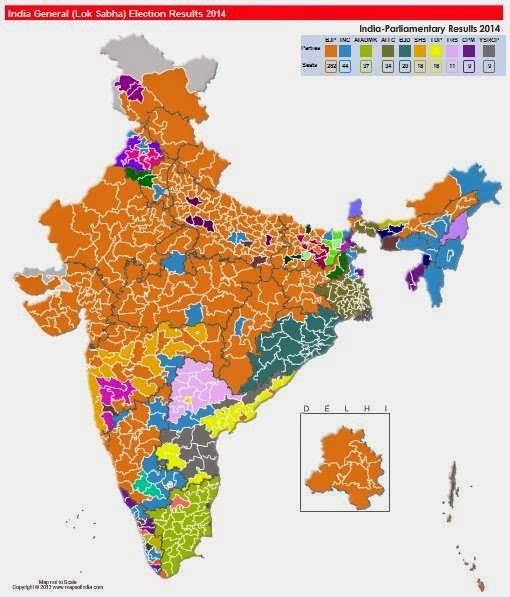 Here I would like to give an excerpt from a famous book titles 'India Unbound' written by the acclaimed author 'Gurcharan Das', it goes like "Draw a perpendicular from Kanpur to Chennai, the region on the right side of the perpendicular will take atleast 20 years to match the standards of the region on the left side"
The eastern states of Seemandhra, West Bengal & Orissa all fall under the region on the right side of the perpendicular and although North-East India can still be given a benefit for being distant, these states on the other hand form a part of mainland. The biggest challenge for the new government more than anything else would be to get these regions which continues to vote in favour of regional parties in the mainstream of Indian economy. Hilly States and North-East India received attention from the center but the eastern states continued to be ignored. Just before the election results the BJD offered support to BJP on grounds that it will award a special status to Orissa. With BJP getting clear majority in the Lok Sabha support of BJD is irrelevant however in the interest of the Nation and in the interest of people in Orissa the new government should keep its ego aside and seriously think of conferring Orissa with a special status and usher an economic revival of the status which is not just based on a few mining companies setting up shops there. This incentive will certainly play a vital role in bringing the people of Orissa in the mainstream of Indian Economy. As Indian economy became more liberalized since the beginning of 1980s there has been a spurt of entrepreneurship across the country. The IT boom since 1990s did not see any major Marwari business house taking to it. As caste barriers reduced and movement of people across he country increased English and Hindi came to be spoken understood across the entire country. With improvement in banking and telecommunication today one no longer faces the communication barriers which early Indian entrepreneurs faced. India is supposed to have one of the best eco-systems today and 60% of the start-ups are from individuals with less than 5 years of work experience. There are a number of venture capitalist with access to funds from India and overseas who are eyeing these start-ups and not only fund their ventures but also help them in executing their plans and help them sail through the first few difficult years of setting up an enterprise. Social networking has enabled aspiring entrepreneurs to connect to people of similar ideas and even find mentors across the globe who would be able to provide an input. Resource group, access to capital etc which have been cited as the success to Marwari enterprise are today at the disposal of any aspiring entrepreneur. Then how relevant is the Marwari enterprise today? not add a single farthing to the country's wealth, but have become the chosen instruments for the draining away of the country's wealth—the lifeblood of the peasants—to foreign lands." Despite his stated admiration for the Marwari penchant for hard work and business aptitude, Ray criticized Marwaris for not reinvesting their wealth back into the Bengal economy. Even the Marwari diet, argued Ray, contributed to the economic drain. The Marwaris "survived" on dal, ghee, and wheat flour‚‚all items imported from outside Bengal. He wrote: "Whatever they spend finds its way back into their own pockets. Hence the Marwari or the Bhatia or the Punjabi, although they make their money and live in Calcutta, seldom add any wealth to Bengal nor is Bengal in any way materially benefited by their being residents of Bengal. They might as well have been residents of Kamchkatka or Timbuctoo." PC Ray's comment about siphoning of Bengals wealth might have been relevant in the pre-independece era when India as a country did not come into being as a Sovereign country or due to over-romanticizing of a nationalist Bengali vouching for its region. However the community led government in Bengal couldn't do any better while in power post-independence. He would have been rather distraught after his founded company 'Bengal Chemicals' became un-manageable after his death and had to be nationalized by the Indian Govt. Even the former Prime Minister of India JN Nehru commented in a rather helpless tone "Giving the drawbacks of the Marwari community and their ingenious practices they are still keep the money within the country and want their ashes to be immersed in the Ganga"
The 'bazaar' market was the grounds for capital accumulation for the Marwari community. As capital got accumulated through trading and speculation same were invested in the manufacturing sector which was a natural extension of the the bazaar which but then had become an essential part of the Marwari culture and identity. In an economy where manufacturing licenses were hard to come buy and the government controlled all aspects right from the quantity of a product produces to the price it was sold in the market the ingenious accounting system of parta developed by the Marwaris proved successful in the manufacturing sector during the license raj. The 'Ambassador' car manufactured by a Birla owned enterprise Hindustan Motors between 1950-1970s having a 'steering mechanism with the subtlety of an oxcart, guzzled gas like a sheik and shook like a guzzler became a symbol of India's sluggish Industrial sector where the marwari community had a major share. Altough some critics might argue that Marwari enterprise flourished during this time next generation family members like Aditya Birla established Industries outside India in Indonesia and Malaysia to become global market leaders their respective Industry. Another Limitation of the Marwari enterprise came was when the business reached a sizable level the promoters of the company would deploy family members at key decision posts which led to reduced accountability and discourage other people in the organization who would be worth that post.